After creating or opening a workspace, you can find an instrument in the Market Explorer in either Basic mode or Advanced mode. Click Explore next to the Search box in the title bar. Select an Exchange, Type, Product, and Instrument. Tip: Use Shift-click to select multiple instruments for a product, or just select the product to open all instruments for that product. Tip: Ctrl-left click on a selected value to unselect it. Check the Auto Roll checkbox to automatically roll the instrument after its expiry. Click a widget in the Widgets field. Click Select to open the widget for the selected instrument. The Advanced mode allows you to easily find options instruments, as well as exchange-defined spread and strategy instruments. Click More in the bottom left corner of Market Explorer. 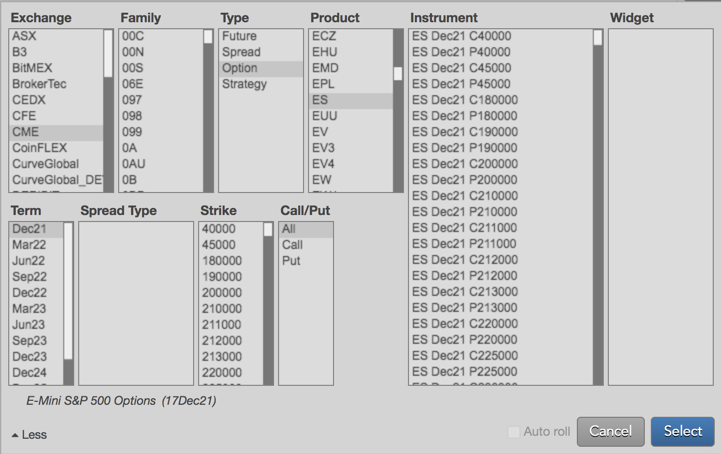 Select a Term, Spread, Strike, and/or Call/Put as needed based on the selected product type and product. Note: The Family field is also displayed in Advanced mode. Tip: Ctrl-Left click on a selected value to de-select it. The instrument search results are filtered based on your selections. Click an instrument in the Instrument field and click a widget in the Widget field.